The chief of staff of the opposition Syrian Military Joint Command calls on the United States to provide arms, not just non-lethal aid. …The Syrian Military Joint Command has built strong links with FSA brigades around the country in order to develop a countrywide military strategy. But there is only so much that can be done without the determined support of the United States. 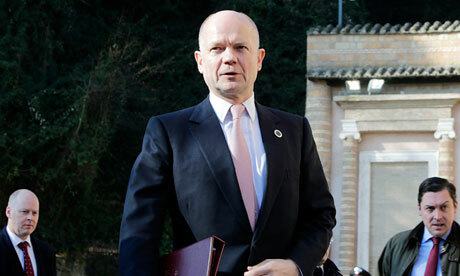 What Syrians need today to bring an end to the conflict are anti-aircraft weapons systems, not more words…..
William Hague at the Friends of Syria meeting in Rome, where he stressed that military aid was possible in future. Some European countries are expected to break with Washington and start supplying the Syrian rebels with weapons in the next few months, the representative of the Syrian opposition in Britain has told the Guardian. The National Coalition’s London representative, Walid Saffour, predicted that by the next meeting of the western and Arab Friends of Syria group in Turkey, due in late spring or early summer, “there will be a breakthrough that will end the restrictions of the European countries”. Kerry has also said that he will criticize Erdogan for recent comments comparing Zionism to fascism, anti-Semitism, and Islamophobia. Putin told reporters that while there was a significant gulf between the two countries’ approaches to the Syrian conflict, this might be resolved “only with a bottle of vodka, or a bottle of fine wine”. Mona Alami: Who are the jihadis in Syria—and where are they coming from? KFAR NBOUDA, Syria — Sophisticated new weapons now in the hands of rebels in north-central Syria underscore how difficult it will be, once more lethal aid begins to arrive, to keep those weapons from Islamist extremists who’ve become key to rebel military advances throughout the country. Rebels who belong to the Victory Brigade – a group whose alliance with the Hama provincial military council makes it acceptable to U.S. officials who are deciding where aid should go – were giddy as they showed off their new weapons this week. They included Russian-made RPG-27s – shoulder-fired rocket-propelled grenades capable of piercing the armor on the Syrian military’s most advanced tanks – and RG6 grenade launchers, another Russian-designed weapon, this one capable of spewing projectiles that explode on contact. But the brigade doesn’t fight alone, and a video that another rebel group, the Islamist Ahrar al Sham, posted to YouTube this month showed fighters using the same kinds of weapons in an assault that was coordinated with the Victory Brigade. Indeed, Victory closely coordinated its offensive in December to seize the town of Kfar Nbouda from forces loyal to President Bashar Assad not just with Sham, but also with fighters from the Nusra Front, which the State Department has designated a terrorist organization aligned with al Qaida in Iraq. Nusra and Sham share the goal of establishing an Islamist state in a post-Assad Syria, and unlike Victory they don’t recognize the authority of the Hama military council. Victory rebels were cagey about how they’d gotten the new weapons. “We have our ways,” said Ahmed Darwish, a brigade leader. The timing of the weapons’ arrival suggests they were part of a recently publicized shipment brokered by Saudi Arabia from Croatia. The RG6 rounds the rebels displayed this week were manufactured in Serbia…..
Not so long ago, the new secretary of state was among those who saw hope in reasoning with Bashar Assad. …. “I try to ask myself where I’ll be after the revolution, and I can’t imagine myself anywhere but in the grave,” Qadi told me the last time I saw him in person. I saw Qadi again earlier this week: As I sat at my computer in Beirut, a YouTube video flashed across the screen showing his body after he had been killed in northern Syria during government shelling and airstrikes. The video, posted online by the rebels, declared him a “martyr” in the fight against President Bashar Assad…..
Ben Hubbard, an Associated Press correspondent based in Beirut, interviewed rebel fighter Abdullah Qadi during reporting trips into Syria. Here is his remembrance of the young brigade commander who died this week while fighting in northern Syria. TILALYAN, Syria — Bundled in a thick overcoat against the frosty afternoon, Mohamed Moussa watched with concern as the town baker worked by flashlight to repair the conveyor belt on his aging oven, the town’s principal food source. Miles from the front lines of the Syrian civil war, Mr. Moussa, the 33-year-old English teacher who leads the new governing council of this rebel-controlled town, spends his time locked in a more mundane battle against desperate shortages of almost everything. Until about three weeks ago, Tilalyan’s roughly 3,800 residents had bread at most twice a week, and its appearance set off a fierce melee among hundreds of families. There was no consistent supply of electricity or water, to say nothing of medicine or heating fuel. Many were still too afraid of Mr. Assad to link their names to a rebel government. Exasperated, Mr. Osman made a surprise announcement late last year at Friday Prayer: a new council had already been set up and was ready to hear complaints. Two hours later Mr. Osman summoned Mr. Moussa and four others: the job was theirs, the imam told them, by his own unilateral appointment. The elders were scornful. “I need men standing in front of me, I need men to talk to, I don’t need children!” one patriarch complained, as Mr. Moussa, the imam and others recalled. The local military brigades resisted more forcefully. Each brigade, most of them loosely organized under the banner of the Free Syrian Army, now has its own rival relief and political wings to position itself for post-Assad Syria, and at one point the Tawhid Brigade from the town of Marea confiscated about a ton of flour from Tilalyan’s dwindling supply. Ahmad Khatib, in charge of relief efforts for the Tawhid Brigade, said Mr. Moussa had no right to make demands since his town had paid so small a price in the fight. “If you bring them 10 prophets from God they will still keep complaining!” Mr. Khatib said of Tilalyan’s young council. But the young civilians quickly shouldered their mandate. With $1,000 given to the council by the Western-backed Syrian national coalition, they fixed damaged converters to restore electricity, needed to power the well in the town. They then set out to negotiate for electricity. A brigade from the town of Al Bab had recently seized control of the hydroelectric generators at the Tishreen Dam but initially refused to share the power. How did they know that the council was not a pack of thieves, the brigade demanded? Then the larger neighboring town of Tal Rifaat was hogging all the electricity, refusing to allow any to pass through to Tilalyan or Marea, Mr. Moussa said. But when it came to electricity, Marea’s powerful brigade and civilian leaders stepped in to help; Marea and Tilalyan are on the same power line. To supply bread, the council pleaded in vain for flour from the international groups camped at the Turkish border. Then they tried to buy it through Tal Rifaat and finally in the battle-torn provincial capital, Aleppo. The answer, council members said, came from Jabhet al-Nusra, the Islamist militia that the United States recently classified as a terrorist organization. The group has distinguished itself not only through its battlefield prowess, aid workers say, but also through its determination to capture resources like wheat silos from the government, so that the group could dispense the spoils as patronage. “They give us flour at less than 20 percent of the real price from the black market,” said Mr. Moussa, surveying the 14 metric tons stored in the Tilalyan bakery, enough for 13 days. Adhan Naser, 34, another teacher on the council, interrupted him. ANTAKYA, Turkey — Gen. Salim Idris, convinced that the last stand of the Syrian Army in the long, grisly fight to control Aleppo will take place soon at the Academy of Military Engineering, dreads the moment. It is not just the 2,000 or so well-armed soldiers already holed up there, inside the square-kilometer campus on Aleppo’s eastern outskirts. Nor is it the reinforced concrete bunkers built under every building to withstand an Israeli air raid. The toughest part for him is his fondness for both the officers in charge and the campus itself. When he defected in July 2012, General Idris, now chief of staff of the rebel forces, was a brigadier in the Syrian Army and dean of the academy after teaching there for 20 years. General Idris, 55, a stocky figure with a neatly trimmed mustache who was wearing a dark suit and tie, said he planned to deploy outside the academy when the fight begins, to make one last-ditch attempt to persuade his old colleagues to defect. “We cannot do anything about it if they don’t,” he said with a shrug. Much of Syria’s future rests on General Idris’s success on the battlefield. Critics say the newly unified command structure he presides over lacks both the ground presence and the heavy weapons that are so desperately needed. Without both, they say, it will be impossible for him to forge a cohesive force from the thousands of fractious, fiercely independent rebel brigades arrayed against the still formidable military of President Bashar al-Assad. Under intense pressure from Western and Arab backers, hundreds of Free Syrian Army commanders gathered in Turkey last December to select a 30-member Supreme Military Council, which in turn chose General Idris as chief of staff. They unified, grudgingly, because they were promised heavy weapons, they said, in particular antiaircraft and antitank weapons, and other, nonlethal aid. Some has materialized, although not nearly enough to transform the rebel effort, General Idris said. He spoke before Secretary of State John Kerry pledged $60 million in additional nonlethal aid and training this week. Previous American aid seemed to amount to a trickle of small, odd lots. The Americans gave him nine ordinary black and gray Toyota pickup trucks, for example. General Idris kept three to move around with his staff and turned over the rest to field commanders. The communications equipment provided is too weak to reach across the country, he said, so he uses Skype. There were enough fatigues from the United States for 10,000 soldiers, which were nowhere near enough, given the roughly 300,000 rebel fighters, he said. In addition to planned training efforts by the Americans, General Idris is urging Washington to train handpicked commando teams to help secure Syria’s suspected stock of chemical weapons if the government teeters. As for financial support, General Idris said very little had been forthcoming. General Idris and various aides say that some 70 percent to 80 percent of the field commanders are loyal to the joint military command, but other opposition leaders and rebel commanders say the number shrinks continuously because of the credibility gap created by the lack of a reliable weapons supply. There is also no shortage of field commanders who say the council leaders are too identified with the Assad government and have too little battlefield experience. “He is a professor, not a soldier, “ said Abu Abdelrahman al-Suri, the pseudonym of a commander of Ahrar al-Sham, a jihadi fighting movement. Dr. Landis’ new post highlights, by distilling opinions from various sources, the facts that the US has been playing a malicious role in this global war against criminal dictators. I agree with this assessment and I have been saying all along that the US is malicious and ‘machinative’ in this war. Therefore, the US should go to hell. It becomes imperative for those who claim to support this revolution of the Syrian people to agree with this asssessment which seems to be universally agreed upon. We cannot claim that we support the revolution and then act stupid by looking at the US as if it is on the same side of the revolution. The US is NOT on the same side of this Revolution. The US is ON the OPPOSITE side in bed with dictators in order to make sure that Israel is happy. We cannot allow ourselves to be deceived by the US repeatedly. It could have taken just 12 million for SNP to remove the Baath Party from Syria and bring genuine freedom and democracy better than the United States one to Syria. Not only that, it would have brought peace to the Middle East. But this is not about freedom and democracy for Syrians nor (God Forbid) peace in the Middle East. This is about “ISRAEL” and bringing its entire neighbor under utter social and economic destruction using asymmetric warfare and slavery of these idiots. In the end, you can spend trillions, and you will not succeed in your evil plan, in fact the end result is demise of the Jews in the Middle East through endless INTIFADA and border attacks by genuine Islamist, not stooges of Israel, the Moslem Brotherhood and Al Ciada/ Al Qaida D.B.A. Alnusra Front, LLC. What Manaf Tlass can do, he is not part of FSA,he is not part of syrian Coalition,is he still a friend of Assad?I don’t see a role for him. Fascism is honorable, Islamophobia is genuine, Islam is the most serious threat to humanity evolution that can only be overshadowed only by Zionism, which is Satanism in disguise (worship of re6pt^ili#an race expelled from the heaven by god). By giving little weapons, it seems that the USA’s strategy and priority are to pressure the coalition create a ‘government in exile’ in North Syria and give it a ‘state’ legitimacy. Can the crooked and divided opposition be able to achieve that that? and if they did, will Al Nusra and other islamists allow these ‘moderates’ pro-West to control the areas they liberated. In my view, once that ‘mini-government’ is announced, there will internal new fights among the FSA factions as well as with al Nusra for the control of the North Syria. A simple post or two about why violence is wrong triggered a number of angry responses. from day one it was clear to many of us that the challenges for this revolt against Assad were mainly to limit the use of violence to self defense,instead of active ambushes and terrorism, to keep islamists out of this struggle or at least limit their role, and finally to win support from fence sitters including minorities, instead this revolt failed on all of the three challenges and that is why it earned my Toz and the Toz of millions of people like me. unlike many of you,I never pretended that I an an “expert” or that I have a “plan”,I yet have to see a real plan from the rebels, I have general ideas that are widely accepted by a lot of Syrians and most of Syria’s neighbors and international powers. I ,form the first day I started posting here, have asked for Assad departure and denounced the use of the army in small battles that should be fought by the police and security forces but when the rebels started using car bombs, anti tank missiles, mortars. RPGs, stolen tanks and SAMs, the regime found a golden opportunity to use heavy weapons and excessive force including jet fighters and SSMs. GCC and NATO-Turkey have led rebels to believe that they can topple a regime with a loyal large army by using light weapons,that did not work,then the same powers added heavier and more lethal weapons and allowed terrorists to join the fight which only resulted in the massive destruction of many syrian towns and cities when the army responded brutally and indiscriminately. I can not be held responsible for the fact that some people are born ,or taught,to be hateful,dumb or angry. when the revolt started, none of the four options were on the table, most people wanted a democratic pleural government, this civlized solution can not be reached when you have a civil war, Mullahs, GCC pimps, Nusra and sectarian hatred, Syria is the victim of a larger conflict and is probably doomed but any solution that does not keep the current regime intact or put Nusra thugs,and their friends, in charge will be better than what we have today, I support forming a government that does not exclude secular and non Nusra islamist figures, that government is not enough to save Syria but it can reduce violence and end criminal sanctions that crippled the Syrian economy and humiliated the same people NATO was trying to “help”. ignore belly dancers and drummers on this blog, the focus must be to end violence and form a government that does not include Assad and his family, that is doable. Sharmine Narwani, an Assad apologist who can be found on Twitter denouncing British universities and the western mainstream media, managed to cast off enough of her principles last month to write an article for the mainstream media while citing Oxford University in her author’s credentials. PS: Don’t think S Narwani is alone in not reading her copy/paste’s. Do you know who pressured Al Khatib to accept to cancel the boycott and meet the 11 friends of Syria and get peanut butter and toothbrushes in return? It’s surely Turkey and Qatar. They would have been too humiliated to meet in Rome with Kerry but without Khatib. Erdogan is a noisy coward and crawls in front of the USA and Europe. He does not give a damn about Syrians. After all the failures, he now wants the Syria’s situation to be just contained so he can be elected president in 2014. That and the PKK neutralization are all what counts for him in 2013. أعرب مناف طلاس عن أمله في اتفاق روسي ـ امريكي لتسوية الوضع في سورية، مشيرا الى امكانية روسيا للضغط على طرف من الاطراف لتجاوز الأزمة. وقال طلاس قبل بدأ مباحثاته مع وزير الخارجية الروسي سيرغي لافروف ان “الشعب السوري تعرض لآلام كثيرة وروسيا والاسرة الدولية قادرة على وضع حد لها، ويمكن لروسيا ان تضغط على طرف من الاطراف لتجاوز الازمة.. ويمكن لنا ان نتوصل الى حل بمساعدة روسيا وامريكا”. وفي سياق رده على سؤال فيما اذا كان يعتقد ان الرئيس السوري مستعد للتنحي قال طلاس ان “هذا الامر غير مطروح لديه شخصيا والأهم هو تكثيف الجهود للتوصل الى تسوية والجلوس الى طاولة المفاوضات بدون سلاح”. واكد طلاس ان “التاريخ قد تجاوز الديكتاتوريات ولم يعد لها مكان فيه”. وتابع طلاس قوله “اما مناورات النظام واعتماده على الحل الأمن لا يجدي نفعا.. واذا اتفق الروس والامريكان فهذا سيصب في مصلحة الشعب السوري”. وفي سياق تعليقه على سؤال حول ما اذا كان المسلحون يفرضون ارادتهم على الساحة السورية قال طلاس “لا أود الحديث عن هذه التفاصيل.. والمهم الآن بالنسبة لنا جميعا هو تخفيف معاناة الشعب السوري ووقف ارهاق الارواح بضمانات دولية تؤدي الى وقف العمليات العسكرية بالكامل”. Kerry is doing the right thing. He may get results. He looks that he is going for it. McCain also started seeing that Jihadis are growing in Syria. There are thousands of Jihadis in Syria today. Only idiots can deny the current good assessments and policies by American politicians. The main question is if they are able to come up with a workable plan with the Russians! keep on bringing irrelevant “info”…go watch some TV..
You gave me 5 thumbs down right away. I see also that you gave Ghufran 7 thumbs down. hahaaaa dude you are not even discreet about it anymore. My dog smelled you right away and barked. I told him: don’t worry this is uncle Visitor the thumbs up and down clow..
Mr. al-Nusra 4 Evarrr what the hell are you doing? 6- it is script for block of 6. When you see 7 thumb downs it is 2, when you see 12 t is 2, when you see 13 it is 3, when you see 20, it is 5 in fact. ندد وزير الخارجية الأميركي جون كيري بالخطاب الذي تطرق فيه رئيس الحكومة التركية رجب طيب أردوغان إلى الصهيونية التي ربطها بالجرائم ضد الانسانية واعتبره “مرفوضا”. وقال كيري في مؤتمر صحافي عقده مع نظيره التركي أحمد داود اوغلو، في أنقرة: “لسنا فقط غير موافقين على هذا الكلام بل نجده مرفوضا”، مضيفا بأنه “سيتطرق الى هذا الخطاب” مع اردوغان خلال لقائه به مساء اليوم. The US recently floated the proposal for humanitarian corridors to protect their rats. That sort of thing won’t work without direct military involvement and even then it will only result in the death of thousands of civilians caught in the war. Humanitarian intervention in the case of Syria would the same as an invasion by foreign powers. The April 2009 State Department cable is conclusive proof of a conspiracy led by the US to overthrow a sovereign government to change the geopolitical map of the region. this isnt enough money for war crimes against a sovereign country, an innocent people with a legitimate government? paul is muttering before his neck gets squeezed by a noose. I’m not anti Alawite. This is about oppression no matter who is involved. Revenire brought up Elvis and I fell for the bait. It just so happened that I came across Elvis Costello and remembered his song. I remember when young I could never make out what he was saying (‘Oliver’). I in fact expressed sympathy when I described how Alawites are being forced to defend Assad. The song has an antiwar theme as well as the appearance of an ‘arab’ in the video and mention of palestine. Let’s not forget that Prof JL and countless SC users have mentioned how the army is fast becoming an alawite militia. There are plenty of heroes of the revolution of Alawite background. One being Fadwa Suleiman. After Rome, when will the 11 FOSsers gang meet again?. As long as the opposition cannot show they are united and able equipped to handle the country’s security, there is no point in asking Bashar al Assad to go and even less to have the government to go. Until now, there has no been a shred of evidence that the opposition is anywhere close to be united and to have control on its military. It is also doubtful that providing more weapons would change that. In the contrary, it may increase and radicalize the divisions and encourage extremists. The outcome is on the ground. The rebels have taken areas in North Syria that are still insecure, but they still have a lot to go to take anything in the South and winning Damascus. Until a breakthrough happen on the ground, the gang of the 11 Fossers will need to meet again and again..
ذكر المكتب الصحفي للكرملين ان الرئيس الروسي فلاديمير بوتين اجرى يوم الجمعة 1 مارس/آذار مكالمة هاتفية مع نظيره الامريكي باراك اوباما. واشار المكتب الصحفي في بيان له الى ان “الحديث اتسم بطابع بناء”، مضيفا انه “جرى التأكيد خلاله على الاهمية المبدئية للتعاون بين روسيا والولايات المتحدة من أجل ضمان الاستقرار في العالم. واعرب الجانبان عن الاستعداد للعمل بنشاط على تطوير التعاون الثنائي المتبادل المنفعة في كافة المجالات”. وقال البيان ان “الرئيسين اتفقا على ان يتعاملا بشكل وثيق بشأن المواضيع الدولية الساخنة المتعلقة بسورية والتسوية الشرقاوسطية وايران وكوريا الشكالية والخطط في مجال الدفاع الصاروخي”. وفيما يتعلق بالازمة السورية اشار بوتين خلال المكالمة الى ضرورة وقف الاعمال القتالية بأسرع ما يمكن. وكلف الرئيسان وزيري الخارجية في البلدين سيرغي لافروف وجون كيري “بمواصلة الاتصالات الكثيفة الرامية الى وضع مبادرات ممكنة جديدة تهدف الى تسوية الازمة سياسيا”. ولفت بوتين انتباها خاصا الى “اهمية زيادة الصلات التجارية الاقتصادية التي لا يتناسب مستواها مع قدرات البلدين”. وذكر المكتب الصحفي للكرملين ان الرئيسين أجمعا على “السعي الى تفادي خطوات معينة من شأنها ان تنعكس سلبيا على العلاقات الثنائية”. واكد بوتين دعوته لاوباما للقيام بزيارة رسمية الى روسيا. وحسب البيان “جرى الاتفاق على ان الرئيسين سيعقدان لقاء ثنائيا ارتباطا بقمة مجموعة “الثمانية الكبار” في ايرلندا الشمالية”. واشار المكتب الصحفي للكرملين الى ان المكالمة الهاتفية جرت بمبادرة من الجانب الامريكي. I feel that the Russians are panicking as they say that they want immediate cease fire. Is this because the SAA is winning? Or more likely is about to collapse? ZOO is frightening himself with quotes from McCain about jihadists in Syria. What did people expect when the regime painted it as a sectarian MB instigated rebellion and in response to sectarian massacres to hold the Alawis and Christians hostage to its fate it got a Sunni extremist backlash. Ghufran where do you think the rebels got their weapons, 99% of which came from army depots? It was because the regime has used excessive and illegitimate force from the outset. 1. Alawi rule over Syria is over. Even with a compromise solution over the next generation they will not be part and parcel as trust is irrevocably broken. 4. Islamist Syria is a possibility which spells doom for the Lebanese and the Iraqis as the conflict between Sunnis and Shias will escalate. Maliki does not want to concede power; power he gained on American tanks and he does not have what it takes to hold Iraq together. Just as in Lebanon, there will be compromise or an explosive civil war. Lebanon is reeling from the refugees and as expected not a dime came through as the GCC were not willing to help a HA led regime in Lebanon look good. To the contrary there is relish in making Lebanon suffer for now. 5. Iran has been effectively sidelined for now with the proposal of counter offers on the positive side rather than the sanctions side. It is ripe for concessions on both sides. If it can come back to accomodation with the West and can restart its economy it will abandon in my opinion Athad. 6. Today’s news of fighting within the city of Damascus and more airports being besieged and two aircrafts down is also a testimony that events on the ground are the main mover. ARMY TAKES CONTROL TRAPPING TERRORISTS NEAR NEIRAB AIRPORT !! Dozens of young men and women put on a public ‘Harlem Shake’ performance in front of the Muslim Brotherhood’s national headquarters in Cairo’s Moqattam district on Thursday. When I read “VISITOR’S” comments like this one to you in the previous thread* I suspect he is a semi-comical entity someone has made up for the purpose of making Muslims look bad. His aggressive rants and insults to others here don’t represent Muslims or Islam, only his own version. If your hundreds of posts to this forum are an indication, you care more about Syria and Syrians, understand and have experienced recent Syria in more detail than VISITOR, have been following the current situation more closely and are far more sympathetic to the Syrian people’s struggle and sacrifice to control their future than he is. He mainly gets a buzz from the holy warrior stuff. That’s the lens through which he appears to view Syria from his sofa vantage point. Zoo, you always support the tyrant Assad and the red KGB mafia in the Kremlin. Then you pretend to be evenhanded and concerned about casualties etc. It’s very dishonest of you to support Bashar and Putin, and then claim to be troubled by the violence in Syria. They are the ones firing Scuds and Migs. It did not need to paint it, history shows it is. Was the the Sunni Moslem Brothehood rebellion in Hama about ‘freedom of speech’ and ‘democracy’? Dear Prof Landis. The heart breaking video at the beginning of today’s post is fake and too obviously staged. The boy is bathed and well groomed without a spec of dirt on him just hours after the attack. His bandage is too clean without a drop of blood on it. He does not display any symptoms of a head injury no matter how slight it is. He is reciting a well rehearsed text without any deep emotion. If he lost all his siblings, relatives, and neighbors he would be too heartbroken and would not be able to utter a single word. I dare say that not a single civilian died in this attack. If one body of a child or woman was recovered it would be all over YouTube by now. When I read your comments, I conclude that you are an impostor in this revolution whose only purpose is to undermine it. Syrians are much smarter than you think. And you, idiot, think you can fool us by continually claiming that you care about so-called relatives, I do not know where in Syria? Listen, stupid idiot, shut your stupid mouth and get the hell out of here. I thunk Visitor is a true Syrian representative of some factions in the ‘revolution’, MajedalKhaldoon too. If you disagree with them, and I do too, I still think they have a right to express what they want. You don’t have to like them. You are trying to reassure yourself by deciding that everyone who is anti-regime but disagree with you is dismissed as a fantasy creations. Face the reality, they do exist. That’s free speech and democracy. israel and jewry manipulate usa and other jewish stooges (turkey to name one) to fight syria because israel, the jew-polluted jewish ghetto for jews, would get treated like the western/gulf puppies-supplied rats are getting crushed. the syrian army would stomp the israeli pussies like a syrian army boot stomps a cockroach. take away usa/western support, the jews are just a bunch of drug dealing, money laundering, organ stealing, slavers and thieves. and homosexual. nothing to brag about. a history worthy of toilet paper. the low of the low. The regime is mortally wounded, but still capable of terrible destruction. Syria is in the grip of a dark winter. The fate of the uprising is tied to that of the Arab revolutions. Its ultimate success is that of these revolutions. الرياض ـ (يو بي اي) ـ لندن ـ “القدس العربي” ـ اعتقلت الشرطة السعودية الجمعة 176 شخصا كانوا يعتصمون أمام مقر هيئة التحقيق والادعاء بمدينة بريدة بالقصيم بوسط المملكة للمطالبة بالإفراج عن ذويهم الذين يقولون انهم رهن الاعتقال منذ سنوات من دون محاكمة. وقال الناطق الإعلامي بشرطة منطقة القصيم في بيان الجمعة” أنه تم عند الساعة الثالثة من فجر الجمعة القبض على 161 شخصاً يرافقهم 15امرأة وذلك بعد رفضهم الاستجابة لتعليمات ومحاولات رجال الأمن التي امتدت لأكثر من اثنتي عشر ساعة لإنهاء تجمعهم غير النظامي أمام مقر هيئة التحقيق والادعاء بمدينة بريدة” . وأضاف ان التجمع ” تمّ لمحاولة تأليب الرأي العام باستغلال قضايا عدد من المدانين والمتهمين بجرائم ونشاطات الفئة الضالة “. وقال الناطق الإعلامي في تصريح لوكالة الأنباء السعودية “واس” أنه “سيتم إحالة المقبوض عليهم للجهات المختصة لإكمال الإجراءات النظامية بشأنهم”، مشيراً إلى” أنه تجري محاولات لتسليم 6 أطفال كانوا برفقة المقبوض عليهم لمن يتولى أمرهم من ذويهم”. وشدد على “أن رجال الأمن لن يتهاونوا في تنفيذ الأنظمة والتعليمات التي تقضي بمنع التجمعات والمسيرات والاعتصامات بكافة أنواعها وسيتعاملون بحزم مع كل من يخالفها”. يشار الى مناطق في السعودية شهدت في أوقات سابقة احتجاجات للمطالبة بالإفراج عن معتقلين منذ سنوات من دون محاكمة. من جانبها أدانت الشبكة العربية لمعلومات حقوق الإنسان، قيام قوات الأمن السعودية باعتقال عدد من النساء والأطفال فجر يوم 27 فبراير 2013, أثناء اعتصامهن أمام سجن بريدة للمطالبة بالإفراج عن ذويهن المعتقلين في السجون السعودية بدون اتهامات او محاكمات منذ سنوات. وكانت قوات الأمن السعودية قد قامت باعتقال أكثر من 50 امرأة وطفل, وذلك عقب مشاركتهن في اعتصام أستمر قرابة 48 ساعة في بريدة بمنطقة القصيم. للمطالبة بالإفراج عن ذويهن المعتقلين منذ عدة سنوات دون محاكمات, حيث داهمتهن الشرطة فجر يوم الأربعاء 27 فبراير، 2013, وأجبرتهن على ركوب سيارة الشرطة وتم نقلهن بعد ذلك إلي سجن الصفراء ببريدة. demonstrations are illegal in KSA, women are not allowed to drive and elections are considred unislamic. In the second part of a wide-ranging interview Newsnight presenter Kirsty Wark talks to the former UK Prime Minister Tony Blair about the crisis in Syria, the revolutions across the Middle East, and his role as the Middle East envoy representing the EU, UN, US and Russia. Kirsty begins by asking Mr Blair at what point he realised there were no weapons of mass destruction in Iraq. dont come any sorrier than blair. people in the opposition who spread messages of hate and violence are useful for the regime, they hurt the opposition, I hope most of us can agree. the point is, there is no way for either side to dominate militarily, Syrians have been told for two years that the rebels will prevail very soon,the same was said about the syrian army, the truth is this is not a war of liberation, it is a war of destruction and it needs to stop. Wrong ZOO, I don’t see “VISITOR” as having any links or role or representation on what is actually happening in Syria. He is more a sofa cowboy who gets a kick out of saying things here I suspect he wouldn’t be willing to say in public in person. Sorry, but I think that ,like you, he does represent one facet of this ‘revolution’, whether you like him or not. With not an exception this is what the hyenas, including “softies” have been defending for two years. Expecting conscience from the likes of regime defenders and apologists is like expecting a bucket of shxt to be shy because it stinks. February 28, 2013 (LD) – The US State Department, and to a greater extent, US foreign policy itself, having exhausted completely their collective credibility, has attempted yet another “reset.” By bringing in John Kerry to pose as the next US Secretary of State, it is hoped global opinion will see US foreign policy in a new, more tolerant light. Kerry, however, has wasted no time attempting to simply resell verbatim the same failed, absurd policy US Secretary of State Hillary Clinton destroyed her career peddling, spinning, and covering up – as finalized in the case of Benghazi, Libya. I don’t give details about my family until the day they are out of danger. But I been open about the fact they are in Aleppo and thankfully in touch by phone. That’s how I know Assad’s agents are still monitoring and threatening people. And unlike you, I have a vision of Syria having a legitimate government and being rebuilt to the ideals and aims of this revolution, not to jihadist fantasies. Thank you for your response in #28. But I been open about the fact they are in several areas of Aleppo, thankfully managing to survive and keep in touch by phone. It is clear that all anti-regime, anti-Alawites war mongers on this blog are precious assets to the Syrian government because they confirm the government’s narrative. These people reject dialog, they obsessively repeat their murderous and uncompromising hatred for Bashar al Assad, they call for more weapons from Western countries allies to Israel, they want to destroy the Hezbollah the pillar of Resistance, they want more bombings to destroy cities, they want more death for the sake of the ‘revolution’. While it may be terrifying and repulsive to read what they write, they are real people and they express their deep conviction. Is it not because what they say serves better the Syrian government that they are fake or pretending. By believing they are contributing to “revolution”, they are actually polluting it. Sbeaking of “pussies”, why is it the syrian army can only kill unarmed Syrians and “out-source” their jew-resistance thru Hezbo-allah? read it to the end ! Syrian Hamster do you even bother to do the math on your casualty list? Over 50,000 of the deaths you yourself provide us are MEN (and we can guess most of those fall into two categories: 1.) Syrian Arab Army soldiers 2.) rats). What funny rodents hamsters are. “He won’t tell me where the marks come from or what the security forces did to him, he’s too scared… when he went missing no words can describe how I felt, I wasn’t sure I’d see my son ever again,” said Abdel-Meneem. However, Interior Minister Mohamed Ibrahim stated on 19 February that no violence is used by the police force against peaceful protesters. Apologies for repeat posts in #41 and #42. I notice this is also been happening with others. Others be aware, the first was “awaiting moderation”, so I requested it be deleted and re-wrote it. But it then appeared as well as the replacement comment. Are the Croatian weapons offered by Saudi Arabia in December already exhausted? What are Qatar and KSA waiting to replenish them from Libya’s stock ? Idris denied media reports that the rebels have recently received arms shipments and said his troops were suffering from “severe shortages” in weapons and ammunitions. Why Uzair why do you hate Alawis? Did we sleep with your underage Sunni girls like your GCC (Visitor’s brothers) do? The ‘good’ rebels say that Al Nusra has better weapons and more money. So the USA should match that unless they want Al Nusra to take over the country or Bashar to stay in power. Rebels of the mainstream Free Syrian Army have told AFP that Al Nusra fighters, despite their small numbers, have greater economic and logistical support than other insurgents and funding from abroad. I am going to take you to task on the bullsh*tting rants you made in 24, 37, 41, 42 & 50. But first you need to be dressed down to size in order to learn next time to speak accordingly. You, idiot, do not ‘dear’ me when you address me. It is not acceptable from your ilk. Second, your 5 second elevator sales pitch about your care for Syria, its reconstruction and your so-called vision has become stale and worn out. It certainly won’t fool any authentic Syrian, and no one cares about you so-called vision. Third your nervousness exhibited by the repitition of the same comment reveals your state of unease about what you’re claiming, because you know it is false. Your explanation in 50 is even more stupid, because we know exactly the reason why this modration comment appeared, and we have very effective means to deal with it without your amateurish advice. اكتب لنا تعليق بالعربية من ١٠٠ الى ٢٠٠ كلمة. يمكنك ان تختار الكتابة بالعامية او بالفصحى كما تشاء. كنت اود ان اتحداك ان تذكر لنا اسماء بعض العائلات الحلبية المرموقة من غير ان تذكر اسم عائلة من تدعي انهم اقربائك. الا انني لاحظت ان هذا التحدي سهل للغاية اذ انني اعلم انك تزور موقع حمودة الحلبي ويمكنك ان تستفسر منه عن الاجابة وبذلك يصبح الاختبار لا معنى له. لقد ادعيت في تعليق ٢٤ علما بالاسلام لذلك ساختبرك بهذا الموضوع. اذكر لنا حادثة رهبان نجران حين زاروا النبي صلى الله عليه وسلم وجادلوه في عيسى. اذكر لنا الايات المعنية بالحادثة وماذا تفهم منها. هنالك ايات في القران الكريم اكثر من ان تعد وتحصى حيث يصف الله تعالى لنا المؤمنين والمشركين والكفار. اذكر لنا ٣ او ٤ ايات من كل فئة وكيف تفهم تلك الايات. تذكر انه عليك الاجابة بالعربية لكي تمر في هذا الاختبار. “Syrian” who are you talking to? I am not sure if you know this but dead people can no longer hear us. The soldiers won’t be answering. I am sure their brothers and sisters will have an answer for you though. Yeah “Syrian” all the families the FSA rats have murdered. Those? I don’t have any relatives in Syria? LOL okay, whatever you say. Manaf Tlass interview he said the regime has to go ,the replacement does not mean islamic radicals , there are those who believe in freedom and democracy and not radicals, and he said both US and Russia must agree to change the regime and put those moderate. Well I don’t trust Manaf tlass simply because his father was the one who helped Hafiz to come to power, his father is womenizer, and financially corrupt, he may be better than his father,but he did not join the FSA so I don’t like him, he needs to go to the barber first. how many dead assad thugs they were? probably over 50. محمد ابن أم علي جيران منال بنت منيرة !! يو تضرسي لك حنان اللي شفناها بعرس زهور بنت. * : نحفت طقيق على جوز عمتها يلي أخدوه على بيت خالته !!! ZOO’s comment above that this revolution is a MB rebellion is the best sign that he is a regime insider. He confounds the 80’s with the current revolution and this has been the deliberate operative of this regime and apparently on the advice of Anitha herself. This is a revolution against slavery and barbarity and corrupting and corrupt and illegitimate regime from its tiniest roots to its highest branches. Trying to paint it as a MB rebellion is farcical at best. RT in English claims that the Iraqi army helped the regime take back the Yaroubia crossing by bombarding the rebels. It was not on Arabic RT. Is this because Russia wants it a regional war to keep the regime? Is it because Maliki is feeling the heat? I am not sure of this new development. Croatian troops are leaving for Croatia has sold weapons to the rebels. Meanwhile, the news from Cham Press and you can go and check out is that the general aviation commission is asking the airlines to resume flights to Damascus Latakia and Kamishli airports with an incentive of reducing fees by 25% and that the airport and the road from the airport to Damascus is secure. Now I challenge anyone to travel to Damascus today. هذا واعتبر المحلل السياسي السوري حسام شعيب في حديث لقناة “لروسيا اليوم” من دمشق ان “هناك بوادر ايجابية على الصعيد الدولي، وهذا ما لعبه الجانب الروسي الذي كان منذ بداية الازمة حريصا، اولا على السلم في المنطقة، وثانيا على ان تختار الشعوب لمصالحها وتحافظ على شؤونها الخاصة”. نشرت مصادر اعلامية صوراً يظهر فيها جهاد مقدسي المتحدث السابق باسم الخارجية السورية قيل إنه التقط في دبي. و يظهر مقدسي في الصورة مرتدياً لباس البيسبول الأمريكي، و قيل إنه كان جالساً في مقهى سبع نجوم في دبي. و كان أصدر مقدسي بياناً بعد اختفاءه بعد خروجه من دمشق، و قال إنه ترك سوريا بسبب “الاستقطاب والعنف اللذين لم يتركا مكانا للاعتدال والدبلوماسية”، معتبرا أن الاحتجاجات التي اندلعت في سوريا قبل نحو عامين “تحمل مطالب مشروعة”. It’s sort of funny to see Iraq shelling the rats. BEIRUT, March 1 (Reuters) – Syrian President Bashar al-Assad’s forces seized a village southeast of the city of Aleppo on Friday, reopening a supply line to the country’s biggest city where they have been battling rebels for eight months, a monitoring group said. Spoken exactly like the bucket filler it is. Erdogan is my type of a president. While Ankara has been aggressive in its policy toward Syria and is not eager to consider the continuation of [Bashar] al-Assad’s government – even as a transitional administration – Washington is notably hesitant toward a decisive move against al-Assad. Washington appears to prefer seeing the government fall without intervening in the situation via further help or support to the opposition. Did Al Khatib take side again with Al Nusra in Rome? If Khatib is defending indirectly again Al Nusra, he has certainly lost more credibility and burnt more bridges with the Western FOS. By not providing them with fresh weapons the FOS are leaving them to be crushed by the Syrian Army. We’ve seen the same when the USA deserted the Shias after encouraging them to revolt against Saddam Hossein. The USA is only concerned by its national interests not by Syrian lives and they fully support Maliki in his fight against islamist terrorists. Neither the USA nor Maliki not want more of these Islamist terrorists praised by Al Khatib to enter Iraq, there are enough of them already to deal with already. As Lebanon does not want them either, they should be either eliminated or send back to Turkey and Jordan where they will be well taken care off. I agree. I too do not like his hair. The USA is in the Empire business. That Hof guy said it all in the piece linked in Dr. Landis’ previous posting: all the US cares about is getting a nice, docile, impotent, compliant, submissive Syria. What’s your point فيلسوف ? Do you know what a figure of speech is? So this is how Sharmine the “regime’s lap dancer” looks like? Ugly from inside out! There is not enough money in the whole world that should silence one’s conscience in not condemning the death of a child. Of course only “intellectual” lap dancers do not think that way as opposed to the physical ones. It will be huge embarassement to Russia if Assad lose Damascus,three vetos,political financial and military support and then Assad lose Damascus,Wow! Today Obama and Putin talked,Putin asked Obama to stop the FSA attack,some concluded that Putin is nervous,because Bashar is worried he may lose Damascus. Assad is massing troops to protect the road to Homs,to safeguard his withdrawal. بوتين يدعو اوباما لوقف العمليات العسكرية في #سوريا .. هذا مؤشر ان الروس لديهم الآن قناعة تامة ان النظام اصبح منهارا ولا يمكنه ان يصمد اكثر من ذلك .. لذلك يريدون ايقاف العمليات العسكرية لانقاذه من السقوط .. الروس يعلمون ان هذا النظام لن يرحل الا اذا هزم عسكريا ..
سابقا كانت روسيا تستخدم الفيتو لتعطي النظام فرصة للاستمرار بالعمليات العسكرية لانها كانت تعتقد ان النظام سينتصر عسكريا ..
انقلبت الآية الآن .. الروس سيعملون على ايقاف العمليات ليحموا مجرم الحرب بشار الأسد .. This is a little awkward for the West. The announcement by opposition and rebels for promised future weapons supply puts their sponsors under spotlight. If those countries do have the plan, now that is a PR disaster. Supplying weapons is never a popular policy. That is why it needs to be in secret or at least low profile. The opposition definitely is quite disappointed and desperate after the fruitless Roma meeting: no weapons. This is a very immature move by the opposition and it shows how poorly organized it is. It also gives the regime and its backers incentive and time to prepare militarily and politically. On the front, even MSM starts to report significant gains by the regime, especially in Aleppo area. Apparently, SAA has more urgency to do more in Aleppo and along Turkey border. After all, many weapons and fighters are from Turkey. We shall see more fierce battles over there and possibly more gains by SAA. And that is also happening close to Jordan border. Turkey government is in dilemma. Ideologically, it is Islamic and it wants to playing leading figure among Islamic country. Inevitably, they clash with Israel. That won’t go well with US. On national interest level, Israel beats Turkey any day. Right now, US and Turkey also disagree on Syria. To me, Turkey government is quite rigid and radical, lacking pragmatic thinking and maneuver. There is sign that US and EU are planning to re-organize the opposition and FSA. They are definitely looking at a future mission: they need FSA to cooperate with them or even SAA to rid of radical Islamists and Jihadist. And it is their national interests now. all the US cares about is getting a nice, docile, impotent, compliant, submissive Syria. So, people in “docile, compliant” countries are enslaved to USA? For example, a millionaire in Geneva is enslaved to a homeless African-American? One MIG shot down near 7hama while committing acts of crime. Another one was shot down near Aleppo. Jobar is liberated, while holy fighters of Nusra hit once again where it hurts most, causing shockwaves to be felt by easily shockable characters here on SC, as usual. They took over يعربية crossing at the border with Iraq. Qassion where the 4th brigade is stationed also came under attack and several positions were demolished. We also know that the FSA is less than 300 meters from Abbasseen square. For all practical purposes, Damascus is a done deal. There was another report which I read recently about the state of extreme anxiety and apprehension felt by the residents of the upscale neighborhood of Maliki because, for the first time in two years, they feel that their future is uncertain. Well-to-do communities abhor uncertaintities. They now realize that the time for them to pay for their indifference and surreal way of life during the last two years has come. At the rate things are going, the regime’s going to be out of airplanes by the end of this year. أصدر عبد القادر الصالح قائد لواء التوحيد، أحد أكبر التشكيلات العسكرية المقاتلة في حلب، بياناً انتقد فيه تشكيل حكومة للمعارضة السورية دون استشارة الثوار في الداخل. وقال الصالح في البيان الذي نشره على صفحته على الفايسبوك، إن “الثوار هم أولى بأن يستشاروا بتشكيل هذه الحكومة”، لافتاً إلى أن “الشعب السوري سئم من التهميش الذي اتبعه النظام طوال الأربعين عاماً “. و بين الصالح ” لقد خرجنا كي نقرر مصيرنا بأنفسنا و دفعنا الغالي و النفيس كي نسمع صوتنا للعالم، لماذا الآن بعد أن سمع صوتنا يفرض علينا صوت آخر بعيداً كل البعد عن مطالبنا و أهدافنا و أحلامنا ؟؟”. none of the islamist terror groups and most of rebel groups are excited about a new government whether anti regime, pro regime or a unity government, they prefer to keep things as they are as long as money keeps coming. Have you asked youselves what those rebels do if the war comes to an end? Have you asked youselves what those rebels do if the war comes to an end? If they for real, not mercenaries, they should take the fight against the infidel Jews, free the Golan and Palestine, then Arabia from Jewish house of Saud. Let’s see if that will come or they take orders from Alciada and will move them away to trash another country. c’mon don’t be deceived by these fabricated news released by the terrorists. Yes we did encounter a couple of incidents here and there but all in all our jets army is still in a good shape for the big battle against Israel. Mari’s thought processes are clouded from too much self-enjoyment. It happens with teenagers sometimes. To hear these apes talk they’re shooting down 10 MIGs a day. It’s funny to watch them make their claims. My feeling is when the war ends with Assad’s victory there will be many rat suicides. It will be like in the Pied Piper of Hamelin when they all went over the cliff. If I was an enterprising man from Tartus I’d start a rat coffin business and clean up. Oooh, naughty Johan with the dirty talk. DEAD OPPOSITION SOLDIERS GET REPLACED; DEAD REGIME SOLDIERS DO NOT. My pet Lady Bug can count to 5.. Fake and an impostor. Get lost. Keep your advice(s) to yourself. Having too many of them does not mean others are in need. The space is NOT yours. But oftentimes there are other facts hidden from view. Congratulations Dr Landis, you got to be interviewed by AJA’s Ghada 3weis, the darling of the Syrian revolution and vice versa. We look forward to seeing the whole interview uploaded soon. Why is it that I can’t help but feel that these groups/individuals have ulterior motives? A true giver is the one who does not reveal his/her identity and expects nothing in return. After the tsunami disaster in Japan, the majority of donations from within Japan (especially the sizable ones) were from anonymous donors. قلبي معك ياأخي معاذ الخطيب … استمعت إلى خطابك في روما بكل جوارحي .. أحسستك واحدا منا بمانحمله من مشاعر وعواطف صادقة .. تذكرت ياسر عرفات في الأمم المتحدة وهو يحمل غصن الزيتون ويقول : لاتدعوه يسقط من يدي !! لكنهم وهو أكثر من مئتي دولة تركوا غصن الزيتون يسقط ثم يسقط معه صاحبه !! أنت طلبت في آخر كلمتك من الطاغية أن يتخذ موقفا واحدا في حياته يحقن دماء السوريين وتعلم أنك تنادي أصما !! وتعرف أكثر مني أن من يستمعون إليك لايملكون القدرة على اتخاذ قرار خارج حدود بلادهم حتى وإن تأثروا بمعاناتنا وبكلماتك التي تهز قلب الحجر . القرار هناك في البيت الأبيض والبيت الأبيض محكوم بألف سبب كي لايساعد . حسنا لقد بلغت وأشهدت الله وشعبك أنك بلغت .. تعال الآن إذن إلى ساحة الثورة فمثلك من يستطيع التأثير في الجيش الحر وفي الحراك الشعبي .. كن رسول الوحدة والتنسيق بين الجميع والجسر القوي بين أهل الداخل وأهل الخارج من السوريين . هذا مانحتاجه اليوم : تجميع قوانا وتوحيدها في الداخل والخارج , وهذا مايكفينا للننتصر وحدنا . أعلم أنك فدائي وتعلم أن من تطلب من السوريين سيلبي نداءك فلا تتأخر في النداء . I think Israelis are the least liked people in this part of the world, and as true as it is, giving without selfish motives is better, but still I think vanity is one motor for charity in this world, at the end everyone likes to be remebered for his good deeds. يقوم فصيل مسلح معارض تابع للجيش الحر بفرض اتاوة على المدنيين الراغبين بنقل أثاث منازلهم ، بحجة دعم المحكمة الشرعية و مجلس القضاء الموحد، وفقاً لشكوى موثقة وصلت إلى عكس السير. و عمل كل تشكيل عسكري خلال الفترة الماضية على انشاء ما بات يعرف “بأمن الثورة”، التي ما لبث ان انحل قسم كبير منها ، فيما يتم العمل حالياً على تشكيل قوى الامن الداخلي. ويقود اللواء المذكور “محمود مجدمي”، و سبق أن فرض اتاوات على سيارات الأجرة و الميكروباصات التي تعبر من و إلى المناطق الخاضعة لسيطرة الجيش الحر. أعلنت القيادة العامة لوحدات حماية الشعب الكردية (YPG) في بيان لها أن لواء الشهيد لوند التابع لوحدات حماية الشعب في منطقة الرميلان قام ومنذ ساعات الصباح الأولى بتحرير معظم مدينة الرميلان، وحاصرت الوحدات المراكز الأمنية للنظام في المدينة. وأشار البيان الى أنه “لا تزال عملية التحرير مستمرة، وخلال فترة قصيرة سيتم تحرير المدينة من كامل بقايا النظام البعثي”. وتابع البيان “تسعى وحداتنا بإخراج قوات النظام البعثي من المدينة دون إلحاق الضرر بالمؤسسات الاقتصادية والادارية المرتبطة بشركة رميلان للبترول، لأننا نرى بأن هذه المؤسسات الاقتصادية هي مؤسسات وطنية وملك للشعب، ومن الواجب القيام بحمايتها”. وفي هذا السياق ناشدت القيادة العامة لوحدات حماية الشعب YPG”جميع الموظفين والاختصاصيين والاداريين في شركة رميلان للبترول أن يبقوا على رأس عملهم وأن يبقوا على تواصل مع وحدات حماية الشعب حتى أن تتضح الامور ولكي لا يلحق أي ضرر بالشركة”. without an accountable government most of Syria’s oil will be lost to smuggling and Turkey and most of the oil under rebels control will not find its way to ciitzens who need it for their cars, homes and businesses. this crisis made a lot of thugs rich, the only thing you have to do today to get away with a theft is to say that you are anti regime and wear a head band with allahuakbar written on it. there are now primitive refinaries in areas like idleb where stolen crude oil is prepared for local consumption at the expense of Syrian economy and people’s health. for decades the Baathist regime directed revenue from oil export to the presidential palace, that is how the Assads started to collect their billions, now instead of having one thief we have few thousands of them. GEN. SALIM IDRIS, convinced that the last stand of the Syrian Army in the long, grisly fight to control Aleppo will take place soon at the Academy of Military Engineering, dreads the moment. It is not just the 2,000 or so well-armed soldiers holed up there, inside the square-kilometer campus on Aleppo’s eastern outskirts. Nor is it the reinforced concrete bunkers built under every building to withstand an Israeli air raid. Why didn’t the FSA rats threaten Iraq? Ha ha. FSA can do nothing as Iraqi artillery tears them a new one. FSA has Iraqi Army on one side, Hezbollah on the other and the Syrian Arab Army grinding them to pieces in the middle. Assad let loose 1000s of Scuds on the rats! Give the order Bashar! Is it not time to stop the madness? in your sleep. And even when your successes would help America. It looks like USA and Russia have opposite interests in Syria, and there can be only 1 victor. It is strange that Russia keeps raising the stakes, if the likely outcome is a Russian defeat in the end. Not even close, dude. You “home-grown” Syrians are the least liked. No one likes you…and that’s the principal reason no one really wants to help you. The Turkish people are good friends of Syria. The Turkish leader is a pig. أعادت قوات النظام فتح خط إمداد إلى مدينة حلب بعد أن استعادت، السبت، سيطرتها على قرية “تل شغيب”جنوب شرقي المدينة. The Turkish government is first interested in business and money, as this is how the AKP can keep it supremacy and Erdogan elected as president. The Arab world is a huge under-developped market, much more lucrative than Israel or the EU. In addition, after years of knocking at the door and executing required reforms, Turkey is still at the door of the EU. Turkey made a strategic decision of turning toward the Arab market where they could sell their goods and benefit of the rich oil countries money. So Turkey has made an effort in emphasizing its Moslem roots and purposely antagonized Israel to obtain the full trust of the Arabs. It worked. Arab countries ignored Turkey for decades when it was friend to Israel, when it was claiming its secularism and that it was part of Europe, now they see Turkey as a Moslem country, enemy to Israel, close to Hamas and part of the Middle-East. The problem is that Turkey needs the USA and Europe, as it is part of NATO and therefore cannot afford to antagonize the West by being too aggressive with Israel. If Turkey solves its problem with Israel, it may loose the Arabs’ trust, therefore it has to play a subtle game. Israel is very eager to reestablish its relation with Turkey as they have no military powerful allies in the region. Israel is now in a internal political crisis. When it will be solved,it will try all it can to put Turkey at odds with the USA and with the Arabs. It is not impossible that Israel is trying to derail the PKK deal being worked out. As for Syria, Israel is quite happy to see Turkey invaded by refugees, and I wouldn’t be surprised that the Mossad is fomenting troubles in Turkey presented as Islamist terrorists attacks to discredit Qatar and KSA. Israel’s medium range plan is to destroy the intimacy between Turkey and the Arab world, the intimacy between Turkey and Iran and most of all the intimacy between Turkey and the West. Then weakened and isolated Turkey will come back to befriend Israel. Give Us the Weapons We Need to Beat Assad ! In this way will turn Syria into mass destruction! Bravo! The newspaper also quoted an anonymous source involved in supplying the Syrian rebels, who said that the movement of weapons to rebel fighters in Syria from across the Turkish border had increased in recent days. “These were not weapons that had been captured from Syrian army bases as before. These were released from the Turkish warehouses. These are weapons the opposition had purchased previously but had not been allowed to take across the border,” the source told The Guardian. This may be a reference to the appearance of Chinese-made surface-to-air missiles in the hands of Syrian rebels, according to Eliot Higgins, a British blogger who tracks the spread of different weapons across Syria. His ‘Brown Moses’ blog has become a valuable source of information to journalists covering the Syrian conflict, and has been used by media outlets like the New York Times, among others. Can you explain how it will defeat Russia in the end, especially the Western alliance for two years and is howling about the fall of the Syrian regime? Al-Qaida in the Arabian Peninsula (AQAP), the most active branch of the terror network, has released an English-language magazine advising would-be militants on how to torch cars and cause traffic accidents. The magazine, released on militant websites, also warns France to pull back from Mali and lists 11 public figures in the west, including the author Salman Rushdie, who it says are “wanted dead or alive for crimes against Islam”. AQAP, based in Yemen, has previously plotted to bring down international airliners and is seen by western governments as a danger to oil-producing Gulf states and major crude shipment routes. Looks like both sides are rushing to an unknown and unpredictable deadline: Both wanted to score big in order to gain grounds before negotiation. Let us face it. The war is not sustainable for either side. It will be ended by political solution. The unsettled question is when and who is going to ”give up” in the negotiation. If the rebels keep losing grounds in the north and eventually giving up Aleppo to the regime, will it be enough to convince the themselves and their backers that their plans are not going to work, they need to sit down with the regime? The danger is what if the West decides to help the rebels to tilt the balance on the ground after the regime makes big gains. The regime will naturally step up using forces. Are we going to see more violence in Syria? The rebels seem to have made their mind at current state. But the West can go either ways. Unfortunately, this time, it is still the case the West gets to call: they are the one who will eventually determine the fate of Syrians in this war. Not the regime or the opposition/the rebels since both of them are too weak to dominate the other. Not the Russians. The naked truth: if the rebels cannot get weapons supplied from the West directly or indirectly, then they will not be able to fight and it is over. An explicit map of the status of cities and areas in Syria ( in french) on the east. Based on personal observations and interviews with a fair number of informed people who actually live in Syria, as opposed to the Zionist “think” tank-arm chair “expert” variety, this observer concedes that prognosticators are finally right. In point of fact, I have concluded over the past few months that the long elusive “tipping point” in Syria has indeed been reached and the momentum has shifted decisively in this embattled. But rather the momentum here has tipped in favor of the current regime due to its capacity to maintain a slowly rising level of popular support, and good relations with key foreign supporters during the current run up to next year’s Presidential election. Then, it will be up to the Syrian voters to decide who stays, goes, and/or joins in their next government. USA is using humanitarian aid as a political tool. Aid efforts, he said, must remain neutral in order for groups to access needy populations in areas held by both sides in the conflict and receive safe passage through war-torn areas. Groups seen as favoring one side over the other may be viewed with suspicion and lose their access to those in need or expelled from the country. MOSCOW, March 2 (Itar-Tass) – The decisions made at the meeting of the Friends of Syria group in Rome may be regarded as the West’s declaration of direct intervention in the affairs of that Arab republic, the president of the Middle East Institute, Yevgeny Satanovsky, told Itar-Tass on Friday. This sort of scenario was tested in Libya. However, in Syria it has been disrupted again and again. “In terms of combat readiness the Syrian army is far better than the Libyan one was,” Satanovsky said. Syrian troops have recaptured the Al-Ya’robiya checkpoint on the border with Iraq on Friday night. According to witness reports on Twitter, Iraq’s armed forces moved in to help with the operation and shelled the border post, which was held by the rebels. An Al-Arabiya correspondent also confirmed that targets inside Syria had been shelled while Iraqi snipers took positions near the crossing. Massive reinforcements have also been deployed to the border. BAGHDAD – Iraq’s prime minister cautions that a victory for [rebels] fighting to overthrow the government in neighboring Syria will spark a sectarian war in his own country and Lebanon That would create a new haven for al-Qaida that would destabilize the whole Middle East. The candid warning from Prime Minister Nouri al-Maliki during an interview Wednesday with The Associated Press was his strongest statement yet about the instability that could follow the toppling of Syrian President Bashar Assad. I applaude this excellent depiction of Al Khatib. I am sure he is starting to realize that and will soon resign..
No wonder, nobody talks anymore about the USA and Russia’s invitation to Al Khateeb to visit. In Rome, they got the confirmation that he is a powerless puppet. Four wounded Syrian soldiers are being treated at a north Iraq hospital after clashes with rebels on the Syrian side of the border, the Iraqi defence ministry’s spokesman said on Saturday. “Four wounded Syrian soldiers were moved to Rabia Hospital, which is close to the Yaarubiyeh border crossing” from Syria into Iraq’s Nineveh province, Mohammed al-Askari told AFP by telephone. The resistance alliance of Iran, Iraq, Syria and Hezbollah won’t be defeated by NATO’s rats. Obama must be freaking out. want to be like america? want what democracy, american style, can deliver? virtually everything is controlled by jewry – the worst pollution. is from me not dr roberts. American “freedom” is not something anyone should be jealous of. Everything in America goes for Wall St. and endless bailouts of bad bets at the casino. Obama lets his people suffer and die without health care or jobs. I had to laugh at the West’s Muslim Brotherhood puppet-dictator Morsi bowing to Kerry – who demanded Egypt get on her knees to the IMF. Beg Morsi, beg. The Egyptian opposition refused to meet with warhawk Kerry. Syria was free before NATO sent their rats. An unexploded US missile-type M47 appeared in the video in the city of Talbeesa in Homs provision. The missile belongs to an American M47 Dragon, a wire-guided anti-tank missile in service with the US military until 2001. The information written on the missile was P/N: 9215698. According to military observers, this figure is enough to find the original source of the missile and the way it reached the Syrians. There hasn’t been any official comment by the U.S. State Department or the Pentagon on this regard. Joshua!How Mr. Kerry understand practically, that President Obama does not want to get sucked into Syria, or a hot proxy war with Iran because the Situation will get worse, and could overflow to other states? Kerry finishes his maiden voyage overseas as secretary of state in the embrace of the Persian Gulf Arab dictatorships, which have been openly supporting Al Qaeda-style terrorism in Syria and elsewhere in the region. Forget the illusions of diplomatic nicety. This reliance of Washington on reactionary, absolute tyrants is the true and ugly face of American geopolitical interests. Kerry’s only significance is the illusion of form over content, style over substance. In terms of expecting any meaningful change in Washington’s foreign policy, you may as well be watching American-style wrestling. If that’s true, shlomo, why don’t you give up? If everything’s controlled by the Jewboys, sooner or later they’re gonna put you back in the asylum from whence you came. Give up. So surrender. You can’t win. But if you’re wrong and everything is NOT controlled by the Jews, you might win. So which is it? Oh and by the way, Shlomo, the nurse at the asylum is not pregnant and she has agreed not to press charges. As long as you get a vasectomy. Nouri al-Maliki came to power through Bush invading the country and occupying it for 8 years. What is he resisting exactly, monotheism? Shia animals used to pretend their fight was all about democracy and purple fingers. Today, they show their true face by scrambling to save Bashar “Dead” Assad. Cette formation se déroule au « King Abdallah special operation training center » (Kasotec) situé au nord d’Amman, la capitale jordanienne. Les membres des Forces spéciales américaines participent à cette instruction en vue de renforcer la capacité d’action des opposants à Bachar el-Assad. Ceux-ci peinent en effet face à la supériorité aérienne de l’armée syrienne. Des Forces spéciales britanniques et une poignée de Français aident également les rebelles syriens, toujours au Kasotec. Nous révélions l’autre jour que des unités Delta des Forces spéciales américaines étaient déployées à Harissa au nord de Beyrouth. Officiellement pour la formation de leurs homologues libanaises. Mais en fait, ces unités Delta font également de la pénétration en territoire syrien. The runaway depravity of the West, its governments, institutions, media, and faux-NGO’s are permanently disfiguring any potential concept of “international law” and has left the people of the West with a floundering legitimacy that will inevitably impact all other aspects of their life, not merely foreign policy. Criminal foreign policy is just one of many symptoms of a corrupt, corporate-financier dominated ruling oligarchy that has hijacked the institutions, charters, and social contracts that bind together a functional society. GOD IS GREAT !!! .. IT’S CRUMBLING FAST AND FURIOUS NOW FOR ALL ENEMIES OF SYRIA !!!!!!!!!!!!!!! .. Many soldiers surrender at Police Academy in #Aleppo. FSA is currently combing the area. Expecting an announcement of liberation shortly. Second prison in #Syria goes down…this time the Central prison in #Raqqa! “I visited these liberated territories two weeks ago with SNC members and realised the achievements. Almost 70 per cent of the Syrian land is in rebel control,” he said. Smurf lives in Michigan, California or Canada? Or is he back in Syria? He is clueless either way and you are very selective about what you post of his. Why not post the one about Homs? You rats keep on posting the victories. It gives us something to laugh at. “ما يتجاوز حدود النفاق هو التحدث عن الديمقراطية بينما أوثق حلفائك هي الأنظمة الأكثر أحادية وسلطوية في العالم والتي تنتمي للقرون الوسطى. من راقب الناس مات بالحمى ! Syrian rebels have hanged two Palestinians at a refugee camp in Damascus on suspicion of aiding the regime of President Bashar al-Assad, a rights watchdog says. “Rebels in the Yarmuk camp executed two men accused of co-operating with the regime by identifying targets that were bombed last week,” the Syrian Observatory for Human Rights said on Saturday. The Observatory, which relies on a network of activists and medics on the ground to collect information, provided a picture illustrating the hangings. In it, two men are seen hanging from trees next to buildings as a crowd of people surrounds them, some taking pictures of the scene. Juergen in the 2014 elections who do you see that might have a chance to beat Assad? My guess is being a war president – wildly popular before but now FLUSH with victory – will catapault Assad into the rare 80-90% of the vote category i.e. massive landslide. I can’t see any candidate beating him. It’s pretty amazing. islamists thugs esp Nusra will probably try to assassinate Moaz and accuse the regime, he has a brain and he cares about Syria, and that is a dangerous combination according to islamist playbook. I believe if Moaz remains in Syria for more than a few hours hiding he will be blown to pieces by the army or murdered the FSA/Jabhat al-Nusra terrorists.